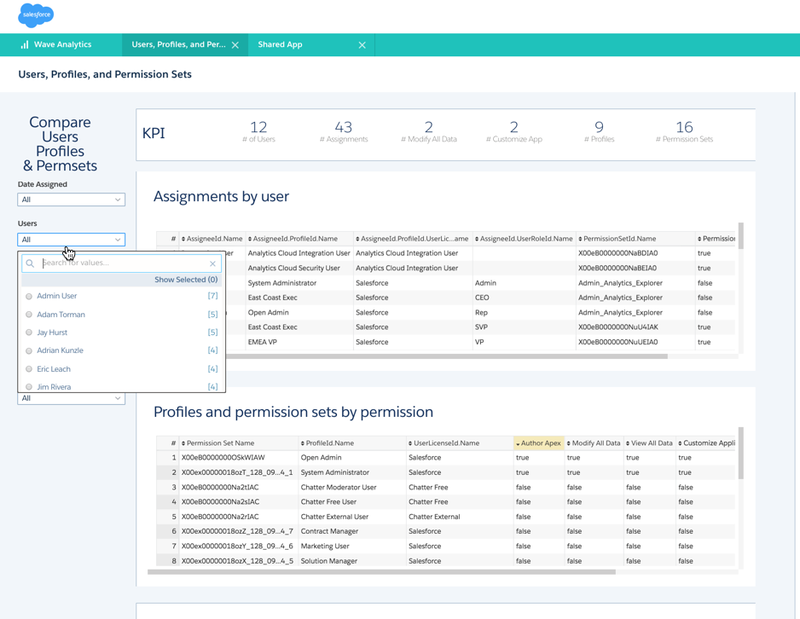 Comparing user's permissions within the Salesforce platform has been a long standing request and non-trivial task for administrators. 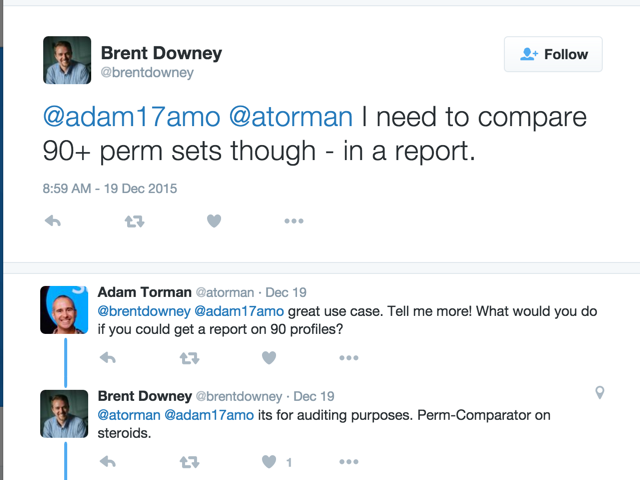 I wrote a blog post on Comparing Profiles and Permission Sets previously about this very topic, outlining some of the challenges reporting on user's access. Since then, it's come up on social media a couple of times, most recently with a twitter post. 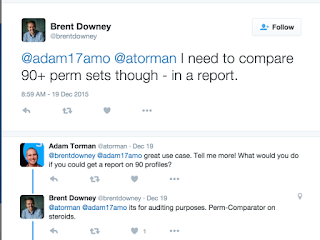 While apps like the Perm-Comparator from John Brock are still the go-to solution for comparing users, permission sets, and profiles, a thought occurred to me that you could also solve this BigData problem with the Salesforce Wave platform. So I set out to use the tooling available via the Wave platform for creating a simple app that compares permission assignments and their containers. It is just a proof of concept but it can be a good starting point for admins who have access to the Wave platform already and want to compare user's permissions. 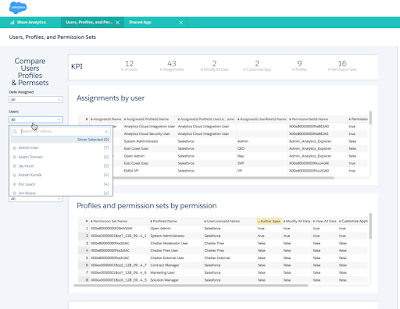 The reason to create this kind of dashboard is to explore both permission set assignments (which include profiles) to users as well as the underlying permission set and profile containers. 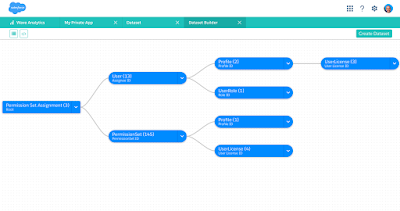 This is done by auto-generating datasets using the Wave dataset builder which is a point-and-click tool that accesses these objects via the Salesforce API. 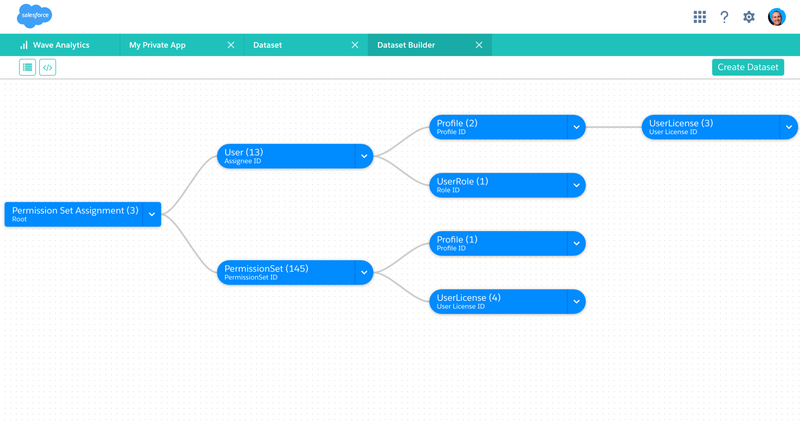 The Wave platform is an incredible tool for exploring complex datasets and cuts through the complexity of users, permission sets, and profiles like a hot knife through butter. If you have the Wave platform already and would like to try this out after the Spring '16 release, check out my Github repository, permissionsWaveApp. Last December, I blogged about how to work with timestamps in Event Log Files. The basic idea is that we generate timestamps in the form of a number that looks like this: 20151210160337.6. Only, it's not a number really, it's a string. For instance, when you add a couple more characters, you get: 2015-12-10T16:03:37.600Z. Look more familiar? More importantly, as an ISO 8601 formatted date time type, it's easier to integrate with third party analytic platforms for trending and time series charting. The same can be said of of other fields like the ubiquitous USER_ID field which is stored as fifteen characters: 005B0000001WamP. However, in order to integrate with an analytics platform like Wave or Splunk, having the standard eighteen character id like 005B0000001WamPIAS makes it much easier to match with the actual User sObject so that you can retrieve other values such as the user's profile or role. The same can be true of any other object that you would want to denormalize so that you can create a report on the top ten users or reports by name instead of by id. In Winter '16, we introduced derived fields as a sleepy enhancement to Event Log Files. It is sleepy in that there is no ticker tape parade, no marketing campaigns, no clappies at Dreamforce. Instead, it's a simple and effective way of transforming data when the file is generated based on patterns and data already contained within the file. It's TEL (Transform, Extract, and Load) instead of ETL (Extract, Transform, and Load). The original data doesn't go away. Instead, a new field is added with a '_DERIVED' suffix. That way existing integrations won't break and options exist for other kinds of non-standard transformations. For instance, the fifteen character USER_ID now has a counterpart with an eighteen character USER_ID_DERIVED and the TIMESTAMP has a TIMESTAMP_DERIVED equivelent. This opens new doors to future transformations. This means applications like Wave Analytics can more easily augment or join data based on these transformed ids and timestamps. Derived fields with Event Log Files handles the problem of data preparation by transforming the data before the file is generated, making future transformations easier. Hope this helps with your integrations!